Now you little girl can wear her new Star Wars Rey Swimsuit to the pool. This girls swimsuit is only available for the little once and it comes in sizes 4 – 6X. On the front of the swimsuit, you can see Rey walking just like she has walked out of the Force Awakens movie. The back of the Star Wars swimsuit is blue and the straps and top edges are pink. 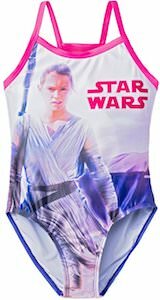 So if your little girl is crazy about Star Wars and Rey then this one piece bathing suit is what she needs for fun at the beach and pool and maybe even swim class. If your child love My Little Pony then you have to check out this Rainbow Dash hooded onesie. The onesie is like wearing a fleece blanket and that makes it perfect for all day wear at home or even outside and you could even use it as a pajama. And you can get this My Little Pony onesie in little and big girls sizes but boys can like My Little Pony to so just check it out. You know that Minions are a little bit naughty and now they worry if they will get anything from Santa this year. This green girls t-shirt shows 3 Minions and they looks all sweet and nice and one even has a red bow on the side. Besides the Minions you can see some silver snowflakes and the text “Is it too late to be Good?”. This kids shirt is made from 100% cotton and will be loved by all the kids specially around the holidays when they are waiting for Santa Claus to come. 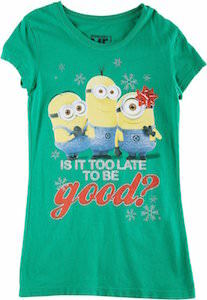 You can get this Minion Christmas t-shirt in sizes 7 – 16 and all are green. Do you let your emotions get to you on certain days of the week, sometimes good sometimes bad? Well why not show them off with a fun shirt. This is an all pink shirt that features a fun and true saying using a play on characters from the cool Disney animated movie Inside Out. The Inside Out t-shirt is available in a wide selection of kids sizes that range from XS to XL which is girls kids sizes 4 to 16, it is made to be both durable and comfortable from 60% cotton and 40% polyester. If your little girl loves cookies and Sesame Street then this Cookie Monster Halloween costume could be perfect for her. The toddler costume includes a blue dress with cookies all over the skirt and a headpiece that looks like the top of Cookie Monsters head complete with the fun eyes he has. This is a officially licensed Sesame Street costume that comes in size 3T – 6X so that many little Cookie Monsters can enjoy dressing up like their favorite TV character. 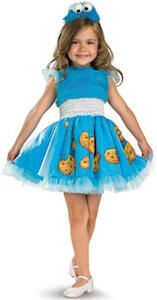 With a dress as cute as this you can only hope that trick or treating will bring a lot of cookies this Halloween. Does your little girl like Princess Ariel? If she does then this t-shirt could be the perfect gift for back to school or any other occasion. The Ariel t-shirt is made from 100% organic cotton and is available in a bunch of fun colors. 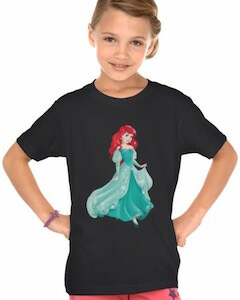 On the t-shirt you can see Princess Ariel at her best in a nice turquoise dress with her long red hair falling down her shoulder. This t-shirt is made by American Apparel and is available in many youth sizes to make it fit the way you want on you child. Now you can give you kid the perfect t-shirt about how they behave some times. 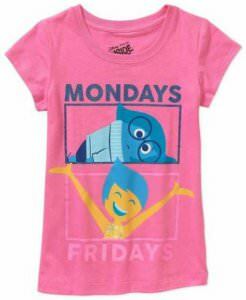 This t-shirt based on the movie Inside Out is purple and shows in green the character Disgust just like we all feel sometimes and just like you can see her in the Disney movie. Besides having Disgust on the t-shirt it also shows the words “What Ever” above her so that the message is loud and clear. 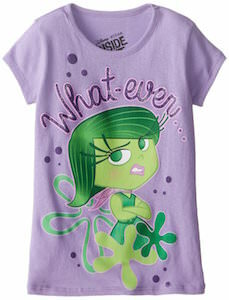 This Inside Out girls t-shirt comes in sizes 4, 5, 6 and 6X and is made from 100% cotton. After seeing the movie Inside Out your kids are gone behave a lot more like in the movie so why not order them this Inside Out Disgust T-Shirt. Do you know a girl that likes Harry Potter? Of course you do and that girl is gone love these Harry Potter pajamas. This pajama set has a white short sleeve shirt with on it the big crest of Hogwarts. And the sleeves of the shirt and the pajama pants are red with on it the logo’s of all the houses that are part of Hogwarts. And these Hogwarts pajamas comes in girls sizes 5 – 14 and are made from 100% cotton and they are an officially licensed Harry Potter product. Now your little girl can reread the Harry Potter books and watch the movies while wearing some themed sleepwear. Every little girl wants to be a princess like 8-year-old Sofia the First from the Disney TV series. You can keep your little princess feeling special with this Sofia the First t-shirt featuring the image of Sofia in her lilac and white ball gown as she walks out of the castle. The words “Best Princess Ever” are written in regal gold letters above Sofia. Sofia is also wearing her crystal tiara and the purple Amulet of Avalor that gives her magical powers, for deeds of pure good, such as being able to talk to animals. This cute light purple t-shirt is 50% cotton and 50% polyester and comes in girls sizes 2T, 3T, 4, 5 and 6. 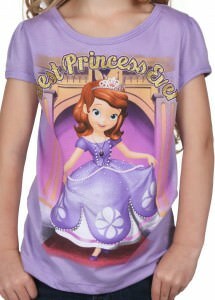 Your little one will look adorable in this Princess Sofia the First Girls T-Shirt. Girls like Disney superhero’s to and that is why there is this kids t-shirt. 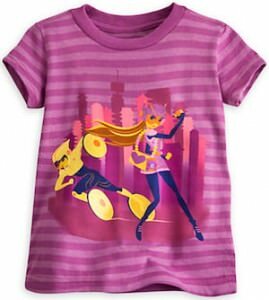 This t-shirt has purple stripes and then in the middle you can see the skyline of San Fransokyo and in front of that you can find the two girls from Hiro’s team Honey Lemon and GoGo Tomago. A t-shirt like this is perfect for the girls that liked the Big Hero 6 movie and now they can find the perfect kids t-shirt just for them. This t-shirt is made from 60% organic cotton and 40 polyester and even has sparkles on it and who doesn’t like sparkles. You can get this Big Hero 6 t-shirt in sizes 2 – 14 so that many kids can enjoy it. Do not wait any longer just come get your Big Hero 6 Girl Power kids T-Shirt.